Several vulnerable elements in the climate system, such as continental ice sheets, Amazon rainforest, West African monsoon, and others, could be pushed towards abrupt or irreversible change if warming continues in a business-as-usual way throughout this century. The risk of crossing critical thresholds or “tipping points” increases strongly with ongoing climate change. 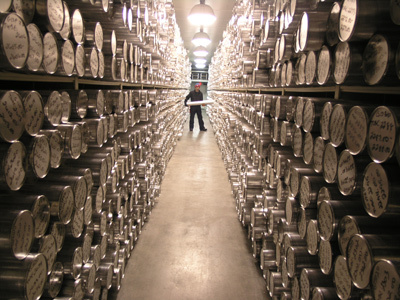 Ice cores provide the long-term record of temperature in Greenland. Over the past 150 years, the Earth has experienced a gradual warming of about 1°C (1.8°F). If we stay the current course, this gradual process could yield to more abrupt climate change. Earth’s average temperature has been very stable over the past 10,000 years, the era during which modern civilization developed, but this stability is being seriously disrupted. Although ice cores demonstrate that climate, in the distant past, sometimes changed very abruptly, future temperatures resulting from our current emissions course will likely exceed anything ever experienced by humans. As temperatures rise, the risks increase that vulnerable elements of the climate system – the polar ice sheets, the Amazon rainforest, West African monsoon, and others – will cross critical thresholds, or tipping points. The melting point – 0°C or 32°F – is one key threshold. Rapid warming in the Arctic has already led to the rapid decline of summer sea ice and melting of glaciers. Greenhouse gas releases from permafrost and methane hydrates (methane frozen in sub-sea and coastal deposits) are projected to increase as warming continues. This matters because there is a huge amount of carbon currently locked up in permafrost, and the methane hydrates alone contain more carbon than all of Earth’s proven reserves of coal, oil, and natural gas combined. Temperature thresholds also exist in natural systems. 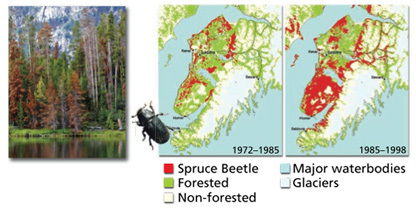 Spruce and pine bark beetles have recently infested vast areas of forest in North America, killing huge numbers of trees. Warmer winters have allowed larger numbers of insects to survive to breed the following spring. Longer, warmer summers enable them to complete two life cycles instead of one and to expand their range northward, while drought reduces trees’ ability to resist insect attack. Finally, trees killed by insects provide more fuel for wildfires, which release more carbon dioxide into the atmosphere, reinforcing the cycle of destruction. Scientists are still exploring such feedbacks, which act as vicious cycles to accelerate warming. There is growing concern that climate change and feedbacks could reinforce each other, triggering rapid and irreversible shifts in Earth’s vital systems.